Well, its Monday and it's time for another Dream Valley Challenge. We have got the most amazing Host this week, and it's Mel and she has picked a theme of 'Flowers'. What a great effort from everyone for the last Challenge I thought that they were all fantastic. As with everything we must pick a Winner, so please check out the Dream Valley Challenge blog to find out if it was you. But I must thank all of you for you wonderful creations, they were all fantastic. The Winner will get $20 to spend in their Store. Have a great week everyone and I can't wait to see how you have used "Flowers" to create your Project this fortnight. Very pretty card and I love that you finished the inside. Thanks for joining us this week at The Stamping Chef! Stunning and so "spring-fully" happy!! Thanks for joining our CIRCLES challenge! The papers are so lovely and go with this sweet girl so well.The layout showcases the image and it's embellished so prettily.Beautiful card,Anne-Marie.Thanks for joining us at Craft Your Passion.Hope to see you again next week. I love the 'springy' feel of this card and the girl looks so happy. Love it Anne-Marie. 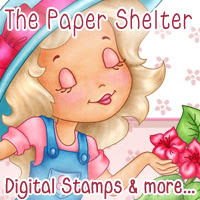 Thank you for playing along with us at DigiStamps4Joy and we hope to see you again.